In the Bucket drop-down list, select a bucket that contains available folders. Make sure the bucket you want to use to store your data was created upfront. In the Folder field, select a cloud folder to which you want to map your object storage repository and which will be used to store offloaded data. For more information about how data is stored, see Understanding Object Storage Repository Structure. To select a folder, click Browse and either select an existing folder or create a new one by clicking New Folder. Never add more than one object storage repository that is mapped to the same cloud folder. Although not prohibited by the system, mapping the same cloud folder to several object storage repositories at the same time leads to unpredictable system behavior and inevitable data loss. 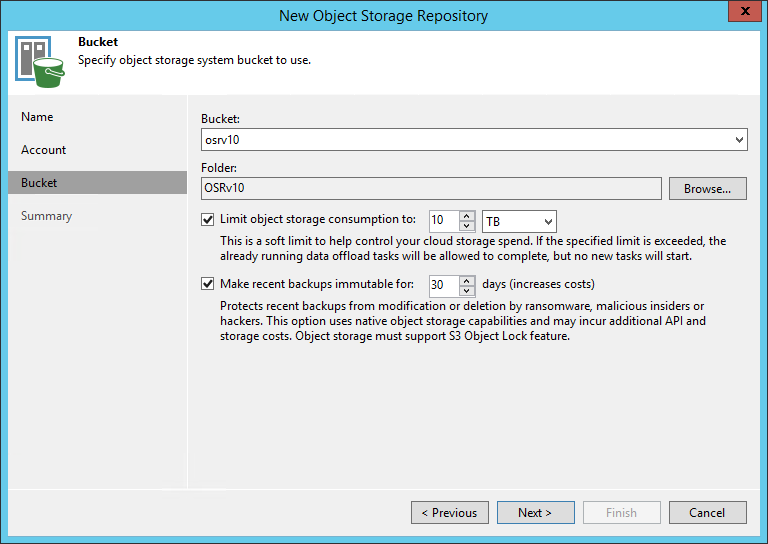 To define a soft limit for your object storage consumption that can be exceeded temporarily, select the Limit object storage consumption checkbox and provide the value in TB or PB.